Previuosly we mentioned about a simple way to load CCcam cfg file into Dreambox decoder suitable for newbies using CCCam cfg editor, but if you don’t want to use this utility and would like to explore further, here is another simple way that you can try. Connect both of your computer and Dreambox decoder to a switch/bridge using Ethernet cable. From the remote control, go to Menu -> Setup -> Expert Setup -> Communication Setup. Read the IP address of your decoder from the TV screen (assuming that you already have the composite video output cable connected from decoder to TV). 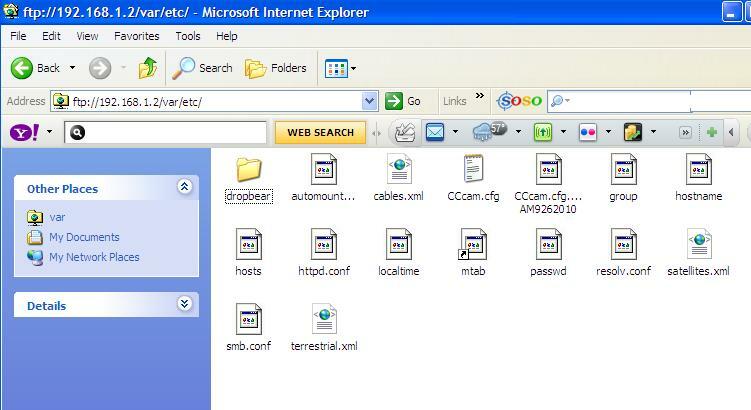 Then go to TV computer screen, open an Internet Explorer, type in ftp://192.168.0.x (IP address read from step ii). When prompted for username and password, type ‘root’ and ‘dreambox’ respectively to access into Dreambox. From here, you will notice a folder view and browse into ‘var’ and followed by ‘etc’ subfolder, look for CCcam.cfg file. Replace it with the CCcam.cfg file gotten from your service provider, reboot the system and you are done. By now, you should be able to activate the card sharing and view your favorite encrypted channels from the sky as long as your dish is positioned correctly.